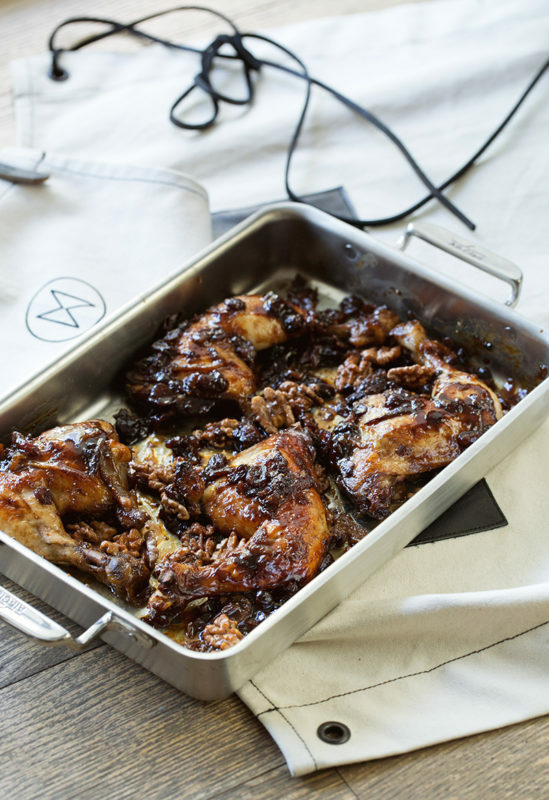 Marinating, braising and simmering… caramelizing figs with cranberries soaked in balsamic vinegar make a glaze over the chicken for a deep, rich taste! The parsley, walnuts and paprika add the crunchy spicy topping…! 1. For the marinade: Heat 1 tablespoon of the olive oil in a cast-iron skillet (or sauté pan) over a medium-high heat. Add the dried figs and cranberries. Sauté for 2 minutes. Add the balsamic vinegar and Worcestershire sauce and simmer to reduce the fruit by one third, about 3 minutes. Remove from the heat. 2. Transfer the marinade to a bowl and place in the fridge to cool. 3. In the marinade bowl combine the chicken and marinade. Mix thoroughly to coat the chicken evenly, cover, and refrigerate for at least 2 hours, or up to 24 hours. 5. Transfer the chicken from the marinade to a plate. Reserve the marinade. 6. Heat the remaining 1 tablespoon olive oil in a cast iron casserole over a medium-high heat. Season the chicken thighs with sea salt and cook the chicken in the hot oil until browned, about 3 minutes per side. Add the reserved marinade and chicken stock and bring to a simmer. Reduce the liquid by half, about 10 minutes, turning the chicken periodically to ensure even cooking. 7. 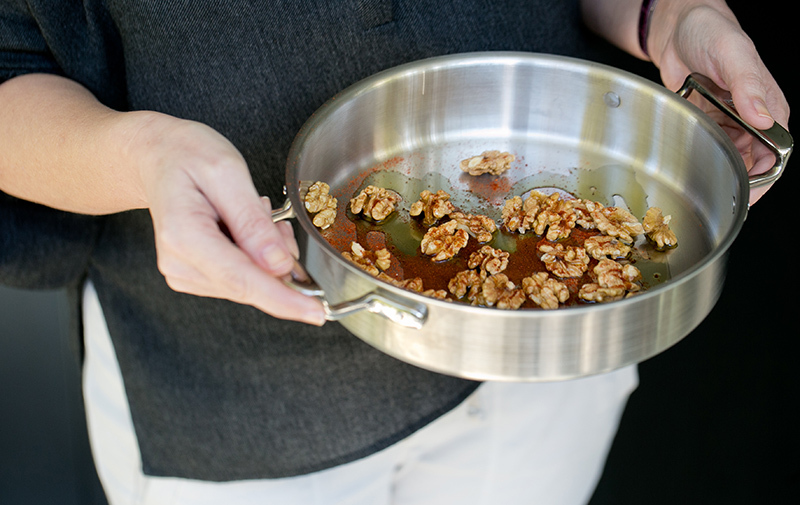 For the walnuts: On a baking sheet (or in an oven-safe sauté pan), toss the walnuts with the olive oil, sea salt, and paprika. Spread in an even layer over the sheet and toast in the oven, about 10 minutes. Remove from the oven. 8. Transfer the casserole with the chicken to the oven; cook for 10 minutes. 9. Remove the chicken from the oven and let it sit for 10 minutes. 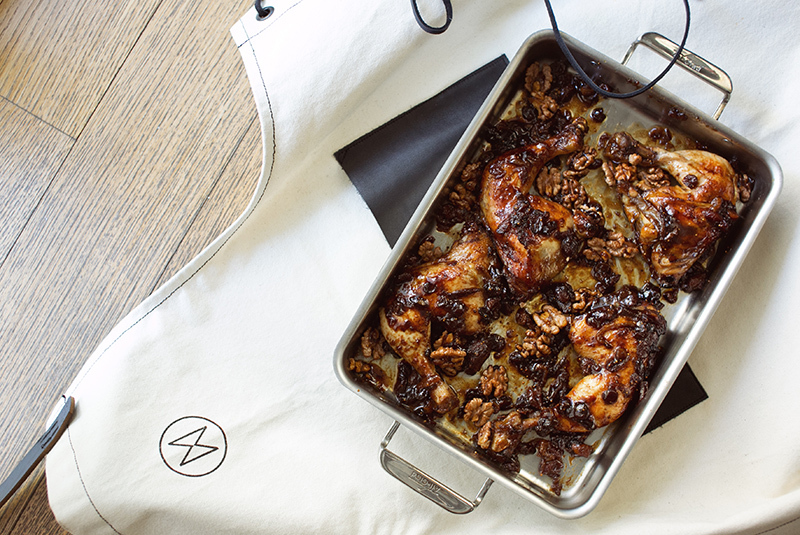 Serve the chicken, garnished with toasted walnuts and fresh parsley.